Cycling has been in my family for a long time, so growing up in this environment made me realize I wanted to become a professional cyclist myself. Greatest racing memory: When I became U23 Belgian national champion. Another memory that isn’t my own but stands out is when my friend Igor Decraene became world champion in Firenze in the individual time trial. He was a good friend of mine and he passed away the year after he won, so I will always remember this victory of his. Race I dream of winning: Tour of Flanders because my uncle, Edwig, won it twice and I would like to win it once in my career. If I wasn't a pro cyclist: I would probably own a nice bar. 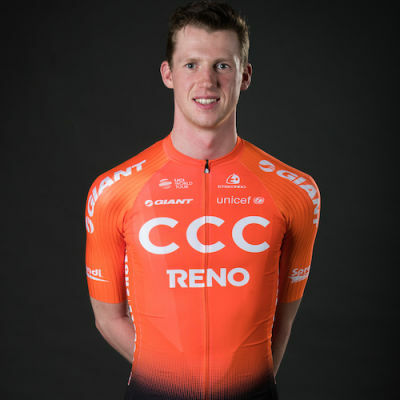 After turning professional midway through 2017, Nathan Van Hooydonck has become an integral part of CCC Team’s classics roster. His strength on the cobbles and his familiarity with his home training roads in Belgium have proven to be assets for the team. The Belgian National Road Race Championships in 2017 was a standout moment for Van Hooydonck, who finished fifth and proved he can be at the front of the race battling against the best in the bunch. He was also the Belgian national U23 road race champion in 2015 and time trial champion in 2016.